According to a study carried out by the Pew Internet & American Life Project, 57% of U.S. adults online have used the Internet to watch video, with 19% doing so on any typical day. And, perhaps predictably, the percentage increases as we move further down the age range. More interestingly, over half of those that had accessed online video said that they share links to the videos they find with others — evidence of the viral opportunities offered by Internet TV — with young adults being the most active sharers of online video. Two in three (67%) video viewers ages 18-29 send others links to videos they find online, compared with just half of video viewers ages 30 and older. Other social activities, such as rating, commenting and uploading, follow a similar trend, with young adults being the most active. 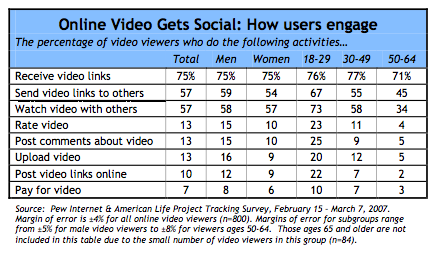 However, perhaps less predictably, the report notes that younger adults are more likely to have paid for online video. Although overall only 7% of those who watch online video said that they had paid for access, this increases to 10% for adults aged 18-29, compared with 3% for those aged 50-64. Not surprising at all. I actually would have thought it would be much higher. hahaha…. it would be nice to see a new stat for this topic… I am guessing it is closer to 100% now.